Patients rely on your expertise while under your care, and now, with Health Library and Symptom Checker, they can find credible information on their own from a source that they know and trust—you. Designed to foster engagement and patient self-management, Health Library provides access to evidence-based information on common topics. It includes text, illustrations and videos to help address consumer health needs, and both a medication interaction checker and pill identifier to assist users in medication management and verification. Providing easily accessible health information helps build trust between patients and caregivers by reinforcing patients’ reliance on you as a valuable health resource. We make it easy for patients to relate your brand with customizable logo, messaging and color options. You can even offer content in English and Spanish to better serve your audience. Our patient-friendly information is suitable for all comprehension levels and can be accessed based on a patient’s condition, disease or diagnosis. Make complicated diseases understandable with overviews of the symptoms, diagnosis, treatments, and do’s and don’ts. Symptom Checker helps you satisfy patient and consumer demand for reliable, evidence-based decision support and self-care information. Derived from the Schmitt-Thompson clinical protocols, it provides step-by-step adult and pediatric care advice, and helps users determine appropriate action based upon their symptoms. Users can explore conditions and minor injuries, and receive guidance when determining how to address common symptoms. Convenient and easy to use, information is presented in clear, consumer-friendly language. Content is available in English and Spanish to better support your patient population. Incorporate your branding and links to locations, directories and scheduling tools to direct patients to your providers for care. Content is reviewed extensively and updated annually to reflect the latest literature and guidelines. 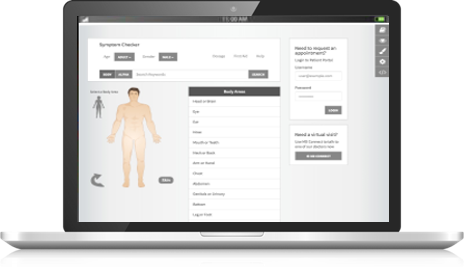 Combining Health Library with Symptom Checker creates a comprehensive discovery solution that empowers patients with education and decision-support in the early stage of their healthcare journey.